Tony Chachere's Instant Roux Mix 10 oz. 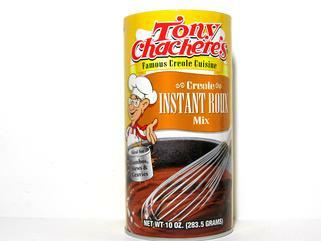 Home » Products » Cajun Dinner Mixes » Soup & Gravy Mixes » Tony Chachere's Instant Roux Mix 10 oz. Enjoy an authentic Creole gumbo in your own kitchen. Tony Chachere's makes it easy and as close to homemade as you can get! This Instant Roux Mix is fat-free and oil-free. Purchase by the case to save!